It’s difficult to describe a typical day in a travel agent’s life because no two clients are same and no two days are same. Every day has its own challenges, opportunities, joys, and sorrows. Each day is different and sometimes even unpredictable. However, between these challenging scenarios, there lies the opportunity to earn big money. If you are ready to learn every day and strive to win, nobody can stop you, there are endless possibilities in this exciting industry. Travel agents are required to carry out managerial as well as administrative tasks on a daily basis. A major part of the day goes in administrative tasks. Inquiries flow in via emails, phone calls or direct walk-ins. They are required to undertake the following tasks to address those inquiries. Design holiday packages: this is the most crucial task of the travel agent. Travellers have their own plan and budget. They wish to enjoy maximum with minimum spending. The travel agent needs to liberal and shrewd. He must incorporate most of the things that the traveller wants and still keep the price competitive. After receiving basic inputs from prospective clients – main goal is to plan out an itinerary that covers all required details. Its crucial to cover exploring of the destination intact with easy and friendly travel plan – strongly keeping in mind not make traveller run during the holidays from one location to another. 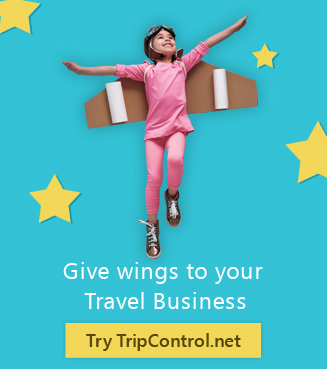 In such demanding scenarios – travel itinerary planner and travel CRM like TripControl (TripControl.net) comes very handy and take away much pain. Documentation: travel agents are required to carry out a number of documents right from ticketing to visa forms and various supporting documents to allow the travellers enjoy a trouble free holiday. Some of the documents are for their internal purposes whereas some are required bookings and fulfilling obligations prescribed by the government. Proper documentation is must for smooth travel. Investment in in-house photo copier and well managed document filing system saves pain and keep the office organised. Bookings: Once the tour package is finalized, the travel agent needs to do the bookings for hotels, taxis, air or train and others as per the requirements which require good amount negotiation skills, knowledge of the location, and needs and desires of travellers. They are required to consider the facilities available and demand of travellers including the budget. This is 2nd most crucial part of the travel professional’s life. Spot and advance booking without any delay is strongly suggested as that helps in getting best deals and keeps the travel plan secured. Always avoid end moment booking and suggest same to fellow customers. Liaising: travel agents are required to liaison with several service providers like hotels, taxis, and others once the travel plan is finalized. They are required to maintain goodwill with the service providers to offer very good travel experience to their travellers. Liaising is required on a regular basis. Such practices many time helps in getting best deals or at least free goodies for the end customers – which gives extra toppings feeling to end customers. Account maintenance: Since travel agents deal with a big number of travellers having different needs and desires, they are required to maintain their accounts on a daily basis. The travel market is highly competitive and crowded. If they make a single mistake, they will either lose the business or get into a loss. Even payment collection cycle has big role in this industry. Training and development: travel market is highly competitive. The number of travellers also increases with every passing day. Travel agents need to be very knowledgeable of their products and the destination. A very high degree of communication skills travels agents are required to upgrade their staff on a regular basis. The most important skills to hone in are communication skills. If the staff can communicate effectively, he can keep the traveller for a longer period of time. Additionally, they should have very good knowledge of the destinations. Nowadays information available on the internet very easily – customer comes with lot of preloaded information and expectations. Since this is an operation-oriented business, staffs are required to be methodological which can be enhanced with regular training. TripControl’s CRM software gives you the freedom and flexibility to incorporate greater tasks in your typical work day, engage with clients, help the business grow and have fun when doing so!